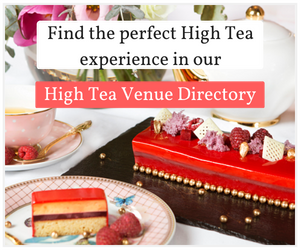 Tasmania is rich in culture and heritage which is well preserved and celebrated today, so what better location to indulge in Afternoon Tea than the opulent surrounds of Hadley’s Orient Hotel Hobart. The heritage-listed hotel has had a colourful past with almost two centuries of stories, secrets and scandals to uncover. The floorboards practically whisper of the hotel’s rich and often tumultuous history or convicts, entrepreneurs, celebrities-past and countless other patrons of days gone by. The current owners have authentically restored the hotel to its former glory with rich colours, gilded wallpaper, chandeliers and cosy colonial style. The centrepiece of the hotel is the plantation style atrium, flooded with natural light, a beautiful oasis in the city even on a gloomy day. 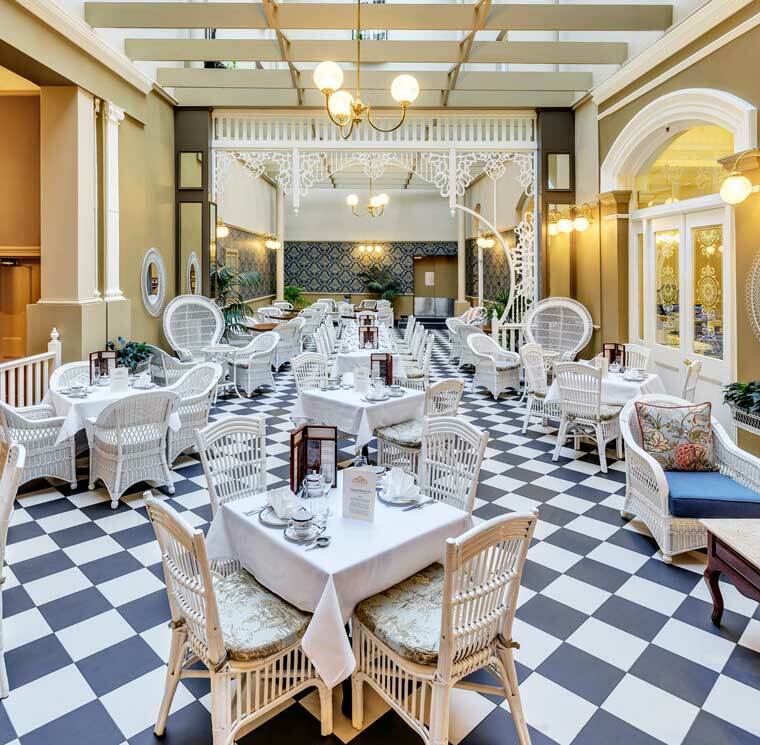 Afternoon Tea is taken in the atrium; the light filled room is furnished with white wicker furniture on a black and white mosaic checkerboard floor providing a striking effect and sense of occasion. We’re seated at a beautifully clothed table by our charming waiter who breaks the initial formality and stiffness be regaling us with a hilarious story from his travels to break the ice. 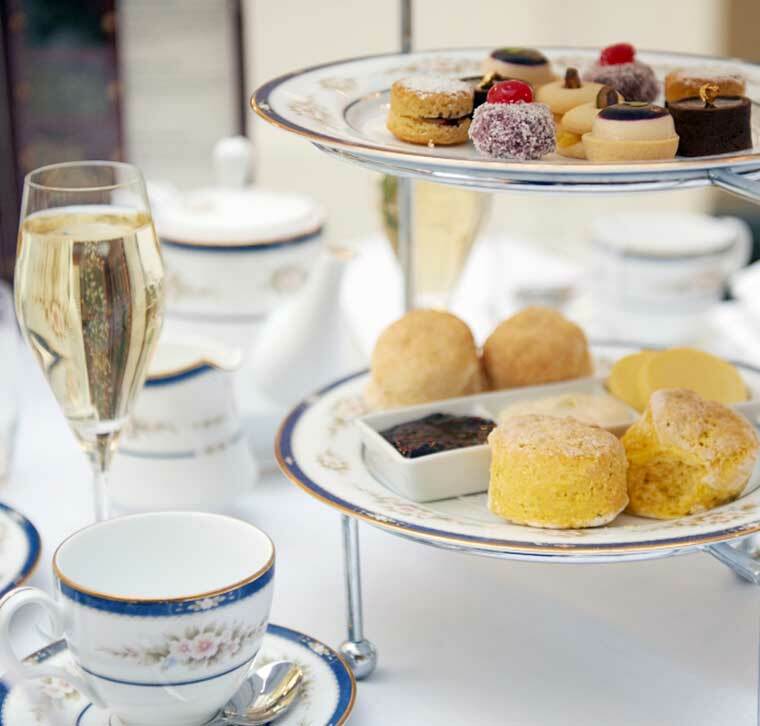 Today we’re indulging in the Royal Tea Experience which includes a glass of local Tasmanian Jansz non-vintage sparkling wine along with the high tea menu of freshly baked Hadley’s signature scones, delicate finger sandwiches, sweet treats reminiscent of the Victorian-era and a selection of fine loose leaf teas. 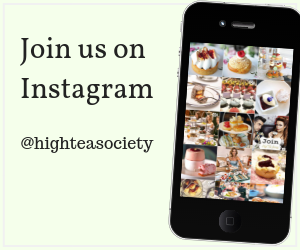 The traditional three-tiered high tea stand appears laden with treats and matches the tablewear of Noritake fine porcelain. The top layer starts with chicken liver pate with house made cheese shortbread – an interesting starter and highlight of the savoury selection in our opinion. The chef selection of sandwiches included cucumber and mint, scrambled egg with house smoked salmon & roquette and Turkey with cranberry and Brie, all skewed together for dramatic effect. Hadley’s signature scones are served with fresh cream, raspberry jam and lemon curd. Lemon curd was traditionally served with scones at afternoon tea, as an alternative to jam in the late 19th and early 20th century England and it’s pleasing to see it making a comeback on afternoon tea stands in Australia today. The sweets layer featured a petite selection of Lemon biscuit with lemon curd, Victoria sponge with a raspberry jam & vanilla butter cream, English Madeleine rolled in cherry jam and coconut, Earl Grey Panna Cotta and saving the best ‘til last – Cadbury’s Chocolate and Turkish Delight Tart. Cadbury’s is an institution in Tasmania, having established its presence in 1922; it’s now a household name in Australia, although sadly you can no longer visit the factory in Claremont. Your tea selection is made from a unique handcrafted tea box menu featuring popular T2 or SereniTea teas or ask your server for notes and recommendation and they will guide you toward the perfect cuppa. 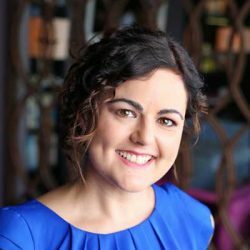 With prior notice, the Hadley’s Orient chefs can accommodate dietary requirements and groups of ten or more can arrange exclusive use of a private room with all the trimmings. Hobart embraces its heritage like no other city in Australia. Entering Hadley’s Orient Hotel feels like you’re stepping back in time, to a grand time where British society mingled with artists, explorers and visiting dignitaries. 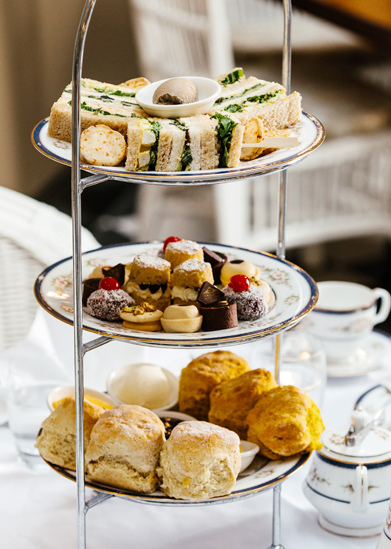 This history is worth preserving and savouring over a traditional High Tea in the elegance of the gracefully restored Atrium at Hadley’s Orient, for the perfect afternoon in Hobart. Wednesday to Sunday between 2.00pm and 5.00pm, bookings essential.